The La Sportiva Synthesis Mid GTX offers a great blend of fit, performance, and fashionable styling. It’s only possible limitations are that it is not the cushiest or widest shoe of the bunch, depending on your load and personal preferences. 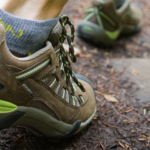 It’s a light hiker that can double as a super burly trail runner, because it’s designed for moving quickly. Overall this is one of the best and one of my favorite shoes in this category for the season. Sometimes your choice in a shoe may be driven by fit, by performance or by fashion, and the La Sportiva Synthesis Mid GTX has it all. It stands out from the crowd for its uncompromising durability, compounded by the waterproof Gore-Tex membrane for use in all conditions. It’s only possible limitations are that it is not the cushiest or widest shoe of the bunch, depending on your load and personal preferences. The La Sportiva Synthesis Mid GTX excels as a light hiker but doubles as a super burly trail runner, because it’s designed for moving quickly. I find almost all La Sportiva shoes to be stiff (laterally) and durable, especially until broken in, and this was no exception. The Synthesis Mid features industry-leading support and fit, which equal stability, perfect for long days on variable conditions at any speed, with almost any pack weight. I can’t say that of all light hikers, but if I had to bet on one, La Sportiva is on the top of that short list. What they call STB Control in the rear adds some torsional stiffness and extra stability. Arch support was good if not great, and even if your ankles aren’t perfect, these hikers provide really good support underfoot. 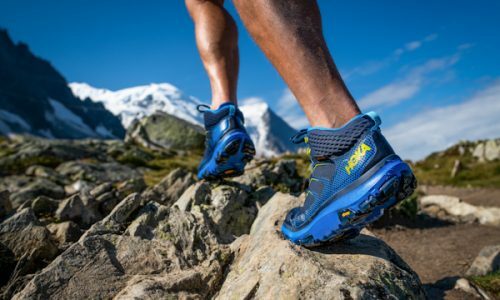 They are extremely stable on rocky ground due in part to the “Impact Brake System” Vibram outsoles – opposing slanted lugs increase breaking power and reduce impact forces. One thing about these shoes is they give you that “bomber” feeling like you can go and do anything in them, and that’s my definition of protection. 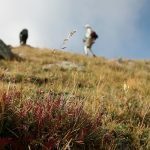 A fairly traditional construction provides above average trail protection. In my experience, fit dictates comfort in La Sportiva shoes. If you can get the right fit, they are as comfortable as any trail shoe out there. If not, they can cause rub, toe bump, and blisters. 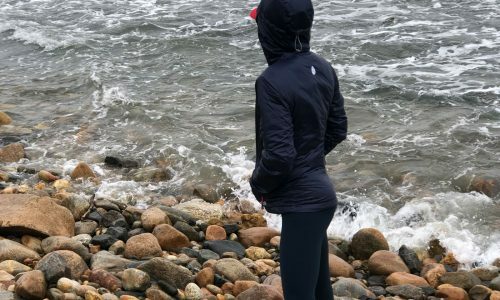 They aren’t made to be the softest and most pliable shoe out of the box, but just as with any product design, comfort often comes at the expense of performance. 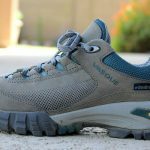 One other comfort/fit feature of note is the “one-pull” fast lacing system, similar to what you might be familiar with in a Salomon shoe. The Synthesis Mid with new Gore-Tex Surround is made with the kind of Italian standards in craftsmanship, materials and design shoe aficionados might expect. They’re inspired by mountaineering boots but designed to fit and function like trail runners. The upper is nylon AirMesh mixed with injected “Nano-Cell” and polyurethane. Instead of a gusseted tongue, there’s a wonderful mesh panel that covers the whole opening. The midsole is a fairly standard compression molded EVA foam with TPU inserts that lend added cushioning for repeated use on rough trail conditions. If you’re new to the outdoor footwear market, just know that La Sportiva is synonymous with performance, no matter the category. The company’s “STB Technology” provides top-of-the-line stability (a key performance factor) by unifying the midsole and the upper inside the shoe, anchored with the no-compromise Vibram sole.